At last, here is the first teaser trailer for Kaito Sentai Lupinranger VS Keisatsu Sentai Patranger featuring the two opposing forces, the Ganglers, Trigger Machines and Lupin Kaizer! 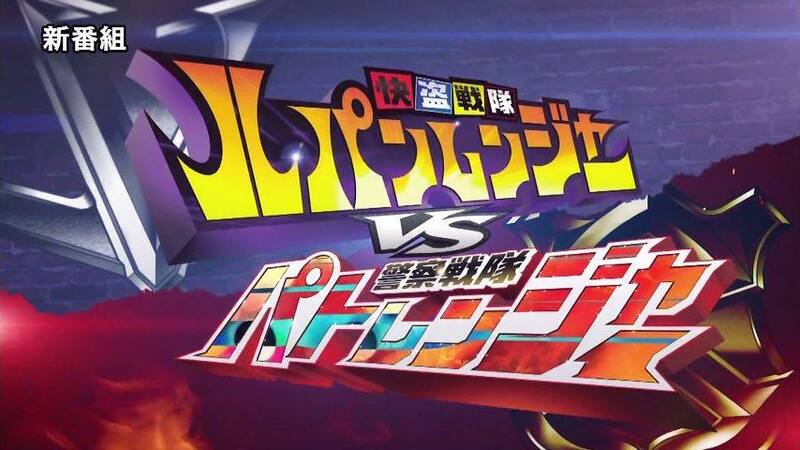 Kaito Sentai Lupinranger VS Keisatsu Sentai Patranger will premiere in February 11th and will replace Uchuu Sentai Kyuranger from the Super Hero Time block after the series ends. looks great but how come we haven't seen an announcement for the Kyuranger vs Zyuohger team up yet? Instead it’s Gokaiger vs Kyuranger. Do your homework dumbass. Sooooo...there's not going to be a sentai team up this year?!?!?!? shishi Red is jumping with his fist in the air which would look like he is shouting "yossha luckkyyyyy!!!" after that he will encounter lupinred and patrenichigo together (they are side by side) and he shakes both of their hands at the same time, and shishi red will then nod his head and leave. As shishi red is leaving, both lupinred and patrenichigo watches him, then the camera closes in to lupinred and patrenichigo ready to fight each other...I have spoken. I agree with the first Anonymous. Where is it? It's usually out in theaters by now right? I have a feeling we won't be getting a Kyuranger VS Zyuohger at this point since it'd be too late, especially when the VS movies are generally hyped up during December alongside and following the Rider Movie War's release and the Sentai VS movies are released in Janurary before the current series is finished. I just hope that if this is the case, Kyuranger makes up with it with crossover episodes instead, but I just hope they haven't been canned like how the Spring Taisen movies have been, it'd be unfair to Sentai given they were doing the VS movies first.